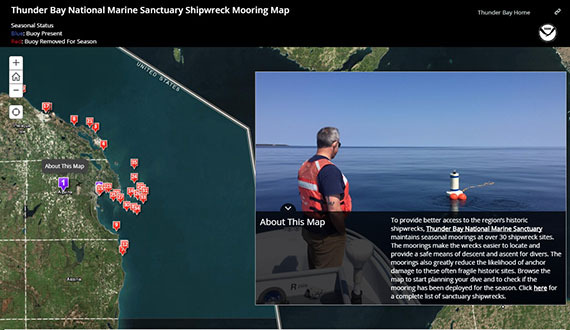 To provide better access to Thunder Bay’s historic shipwrecks, Thunder Bay National Marine Sanctuary maintains seasonal moorings at many shipwreck sites. The moorings make the wrecks easier to locate and provide a safe means of descent and ascent for divers. The moorings also greatly reduce the likelihood of anchor damage to these fragile historic vessels. Many of the buoys are white with horizontal blue stripes, lighted to increase visibility at night, and feature already prepared attachment lines. If the lines are not long enough for your vessel, pass your own line through the looped end and cleat it as you would an anchor line. Buoys may be used by all visitors, though on a first come first served basis, and divers have priority over other users such as fishermen, kayakers, etc. The moorings are a safe, highly-visible replacement for the many small and unlicensed marker floats that are frequently placed on the wrecks. The mooring buoys are installed and removed seasonally, so be sure to check the interactive map below for moorings status. Click the image below to learn which shipwrecks have moorings in the sanctuary.